Making good things happen is at the heart of your organization’s mission. But what’s the smartest approach to achieving and sustaining your goals? 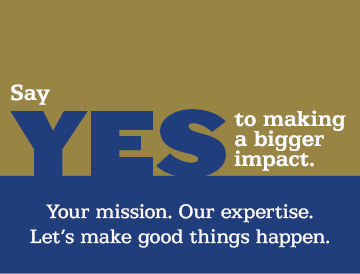 Through Charities and Endowment Services -- our investment practice for non-profit organizations, we’ve been helping non-profits reach their goals and create a bigger impact through our dedicated team of experts. Our team has walked in your shoes. We have spent our careers working for non-profits and serving on non-profit and charity boards. So, we have deep understanding of the unique and complex challenges you face. That means you get an unparalleled level of service and support. Whatever your mission, you deserve a partner with the expertise and resources to make good things happen. Let’s pursue your purpose, together. Our approach begins with an analysis of your Investment Policy Statement (IPS). We collaborate with you to develop a sound IPS combined with a rigorous portfolio design process aligned with your goals. Gift annuities. Charitable remainder trusts. Charitable lead trusts. We specialize in a range of planned giving instruments and help support your efforts with leading experts to work with major donors. Endowment governance is a critical component to your investment strategy. We access your risk profile and help you develop sound spending policy and investment policy guidelines. Download these no-cost white papers. Discover these top 10 pro tips for boosting your fundraising success. Explore how the 2017 tax Cuts and Jobs Act could impact your charitable organization. Call 610.332.7140 to arrange a no-cost analysis or fill out our contact form. Fulton Financial Advisors operates through Fulton Bank, N.A. and other subsidiaries of Fulton Financial Corporation and is headquartered at One Penn Square, Lancaster, PA 17602. Securities and Insurance products are not a deposit or other obligation of, or guaranteed by the bank or any affiliate of the bank; are not insured by the FDIC or any other state or federal government agency, the bank or an affiliate of the bank; and are subject to investment risk, including the possible loss of value. Copyright © 2018 Fulton Financial Advisors. All rights reserved.